The Series 6E adapters deliver the robustness of hardware RAID in an entrylevel solution. They offer the same 6 Gbps performance of our Series 6 adapters, but are optimized for platforms where a Series 6 adapter would not fit due to price, form factor, or host connectivity. 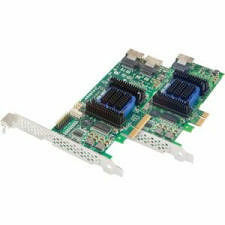 The 6405E offers maximum connectivity through a 1-lane PCI Express 2.0 interface that fits into any industrial PC, workstation class or entry server class motherboard, while the 6805E has a 4-lane PCI Express 2.0 interface for application that require more bandwidth. The 6405E and the 6805E support a maximum of four and eight devices, respectively, as neither supports expanders.